This is going to be a very long and rambling entry, because I want to detail as much as I can for the benefit of anyone reading who might be in a similar situation. The tl;dr version is that it's good news. Wasabi was captured and put in Possum Hospital. He was treated, his condition improved rapidly, and he has now been released. One important factor behind the success of Wasabi's treatment is that a team of people with different, complementary, skills were involved. It's probably best if I don't credit people by name, since not everything was done strictly by the book (If everything had been done by the book, Wasabi would most likely be dead by now), but if you're one of these people reading this, hopefully I've written this entry in such a way that you can recognise your contribution. Two vets were heavily involved, one donating an extraordinary amount of time and another supplying the medications. Another two vets were indirectly involved. People waited up all night (literally) for Wasabi to arrive. People scoured the web for information on every single aspect of the process, and then had the unenviable task of sorting the wheat from the chaff. I was also personally given a great deal of moral support during this stressful time. Wasabi could not have been given the standard of care that he received without the contributions of everyone involved. Wasabi had a large wound on the back of his tail that looked as if it kept getting re-injured. 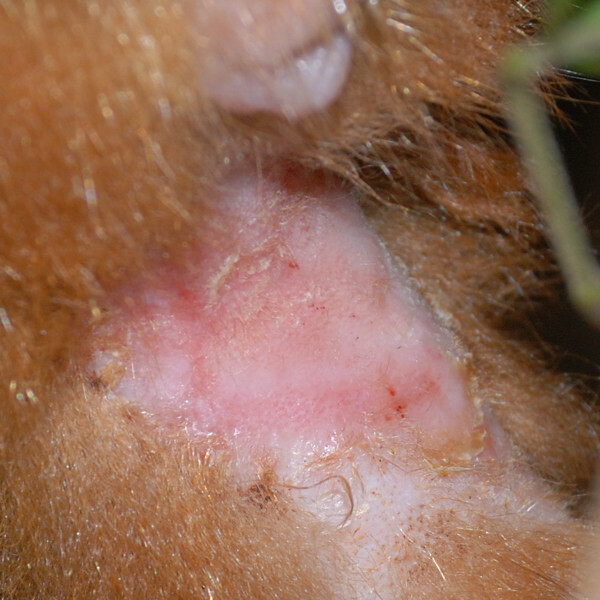 This wound was somewhat infected and there was a raw patch of skin under his tail which also looked infected and had an appearance similar to exudative dermatitis in brushtails. He also had a number of bald patches on his tail, seemingly related to the injury. There seemed to be three possible causes (repeated physical injury, skin infection and demodectic mange) none of which, by itself, would adequately explain the whole situation. It's likely there was a combination of interrelated issues, with stress being a significant factor. Wasabi's wounds were getting worse over time and it looked like he needed some help. 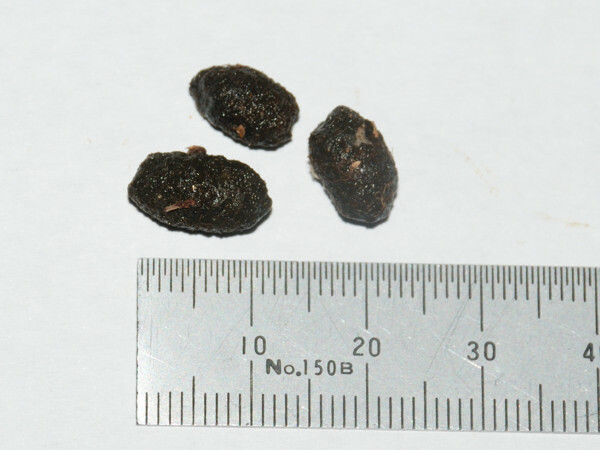 The main problem was that - regardless of any other issues - the wound was infected and needed treating with antibiotics. Unfortunately, ringtails (supposedly) can't be given oral antibiotics, and Wasabi also often goes away for long periods of time, so he couldn't be relied upon to turn up on time for his dose every night. This meant that he had to be captured and held in a cage while being treated. This in turn was a difficult and risky thing to do because ringtails are (supposedly) very susceptible to stress, and stress may itself be the underlying cause of his problems. At the time of my last post, a possum aviary had been prepared for him, some syringes loaded with Baytril had been obtained from a vet and some Ivermectin (in the form of Avimec®) was purchased on the advice of the same vet. Some probiotics were also obtained, for reasons explained later. 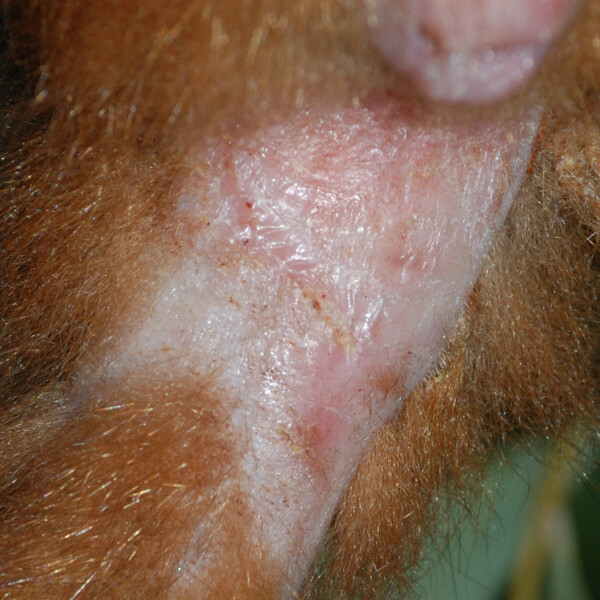 The literature says that ringtails are susceptible to mange, however two different vets (both of whom have treated ringtails) have said that mange is "highly unlikely" with a ringtail. But then again, a vet is only going to see the animals that are brought to them to treat. Ringtails tend to keep to themselves and probably only get brought into a vet after being attacked by a cat or hit by a car. An otherwise healthy ringtail leaping around in the trees that's missing a bit of fur is unlikely to be brought to a vet. A complicating factor is that ringtails can apparently lose some or all of their fur* for unknown reasons. 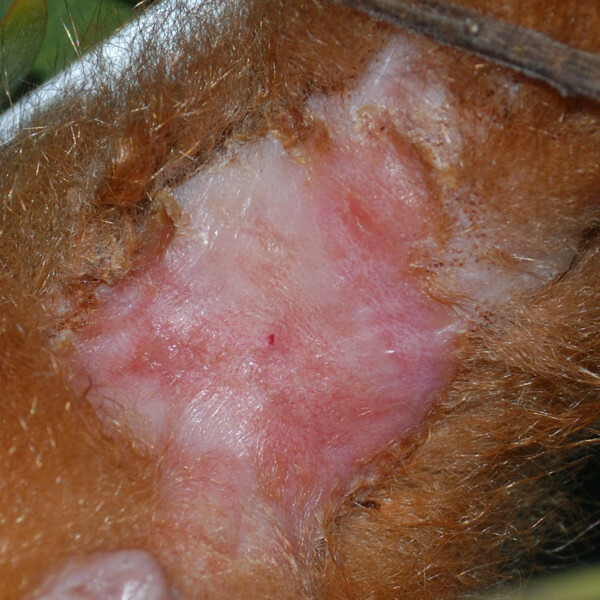 Demodectic mange can be diagnosed by taking skin scrapings, but this needs to be done with a scalpel under anesthetic, and it's much easier and safer to simply treat for mange if it's suspected. 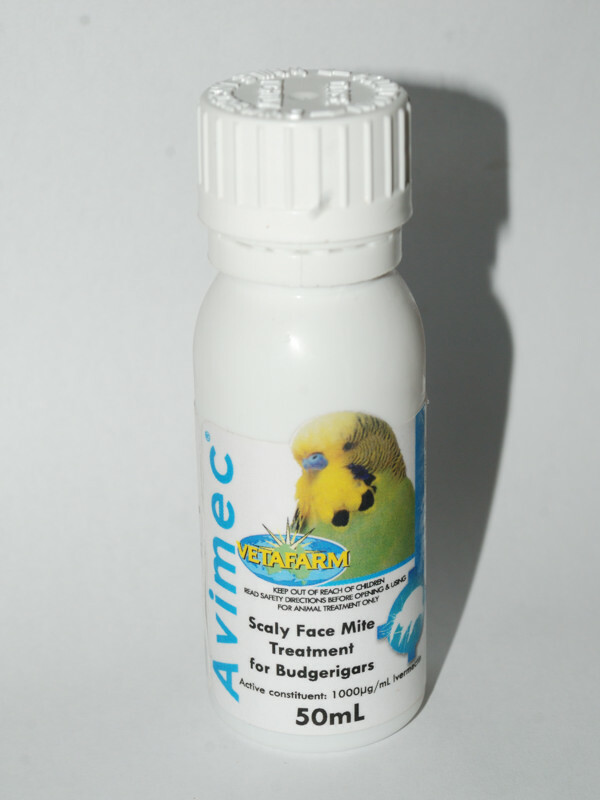 Ivermectin is fairly benign and, in the form of Avimec®, relatively easy to apply. 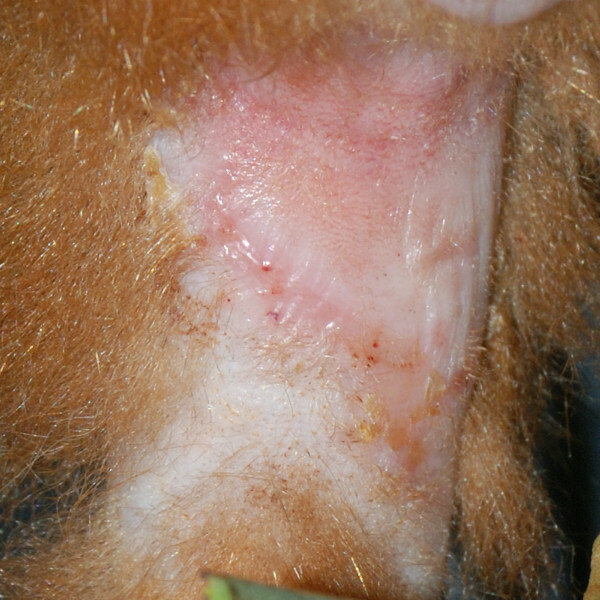 Since Wasabi did have bald and thinning spots of fur consistent with demodectic mange, it seemed to make sense to treat him for it, even though his primary problem was the infected wound. He was treated with Avimec once at the start of his stay, and once just before he was released. Supposedly, two treatments like this, one week apart, is optimal. The information available on using antibiotics on ringtails is shockingly incomplete and doubtful. "Antibiotics - Due to their reliance on intestinal micro-organisms to digest their food, marsupials should NEVER be given antibiotics by mouth, only by injection." This, I have to say, is nonsense. Anyone following this blog will be aware that a large number of brushtail possums (I think around 15) have been successfully treated with oral antibiotics here. Sometimes extended courses of antibiotics, at a higher than normal dose (and on one occasion an accidental overdose), were given without any ill effects. Dr Jim Pollock has successfully treated many hundreds (quite possibly over a thousand) of brushtails with oral antibiotics. 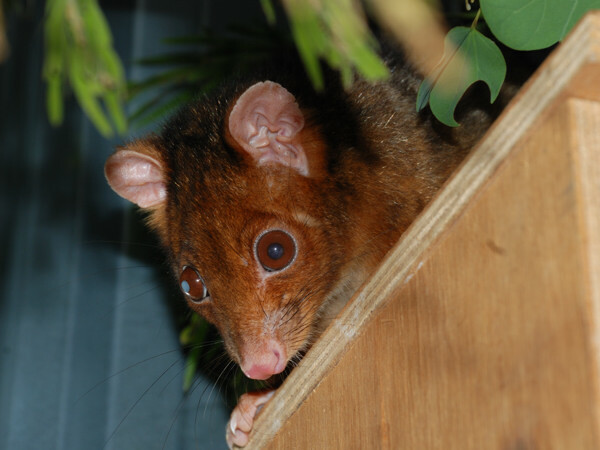 Other sources say that oral antibiotics are OK for most marsupials, but can't be given to ringtails, whose digestive systems are said to be considerably more sensitive. In veterinary circles, a common rule seems to be that ringtails can only be treated with Baytril, by injection, and should only be given a course of "3, but at most 4 days", instead of the usual 5 days. This rule, which has the appearance of an urban myth, quite possibly originates from the conference paper Urban Possums And Cat Attack [Beverly Young]. This paper recommends shorter than normal courses of antibiotics for ringtails, but does so on statistically questionable grounds [this is not a criticism of the paper, which did its best with the limited data available], and more to the point, this limitation only applies to juvenile (<400g) ringtails, and not adults which it says are less sensitive to antibiotics. Also, it says that administering Baytril orally had no more side effects than giving it by injection. The issue might be that ringtails (and especially young ringtails) in captivity are particularly susceptible to Caecal Stasis, which is difficult to treat and usually fatal. This condition isn't well understood, and has been linked to the use of oral antibiotics and also poor diet (generally too much fruit). Consequently, there's a tendency to be overcautious in giving antibiotics and feeding fruit. Nevertheless, we didn't want to take any chances with Wasabi. The idea was to give him a short course of Baytril by injection. He would be fed probiotics afterwards and his condition would be monitored (poor appetite, lethargy and diarrhea being things to look out for) during and after treatment. He would be kept at least an extra day after the antibiotics were finished to ensure everything was continuing to improve. In the event, he was actually kept an extra two days to be sure. Probiotics are a somewhat doubtful thing. In theory they make sense; if gut bacteria get killed off by antibiotics then you should eat more (good) bacteria to replace them once you've finished your antibiotics. But the issue is that most likely any bacteria you eat are going to be destroyed by your digestive system before they get into your gut. A lot of stuff like this - despite being widely used on people and animals alike - may actually be of little or no use in practice. It's also questionable how much an injected antibiotic will affect the gut flora. Apparently some types can, but it depends on how the antibiotic get transported inside the body, which can be a complex business to determine. 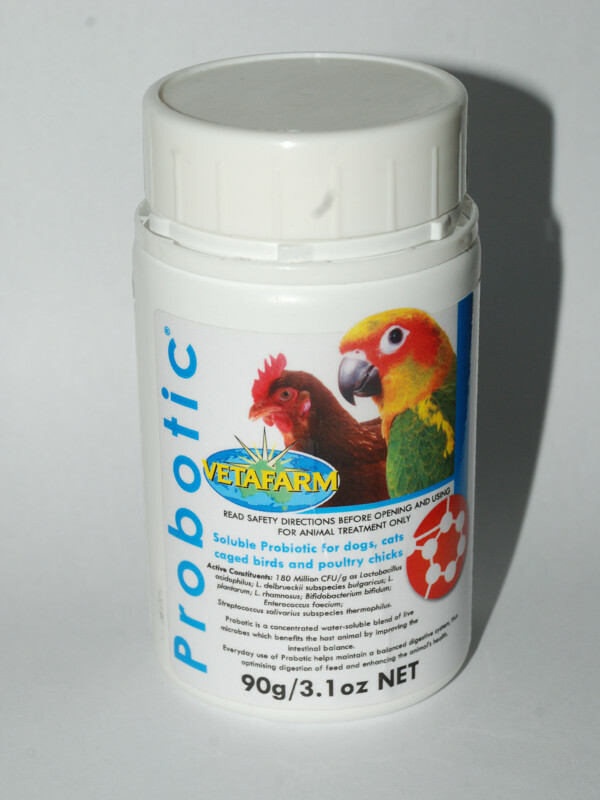 Nevertheless, probiotics aren't harmful, so there was nothing to lose if he would accept them (which he did). I wasn't happy about giving him injections. I'd never given an injection before and I really hate getting injections myself. But it seemed selfish to chicken out and subject Wasabi to the extra stress of being taken away to be dosed by some vet or wildlife carer, in unfamiliar surroundings with unfamiliar food and unfamiliar people. Also, I didn't want to run the risk of some "expert" deciding he needed to be euthanased "because he won't be able to survive in the wild with a bad eye". 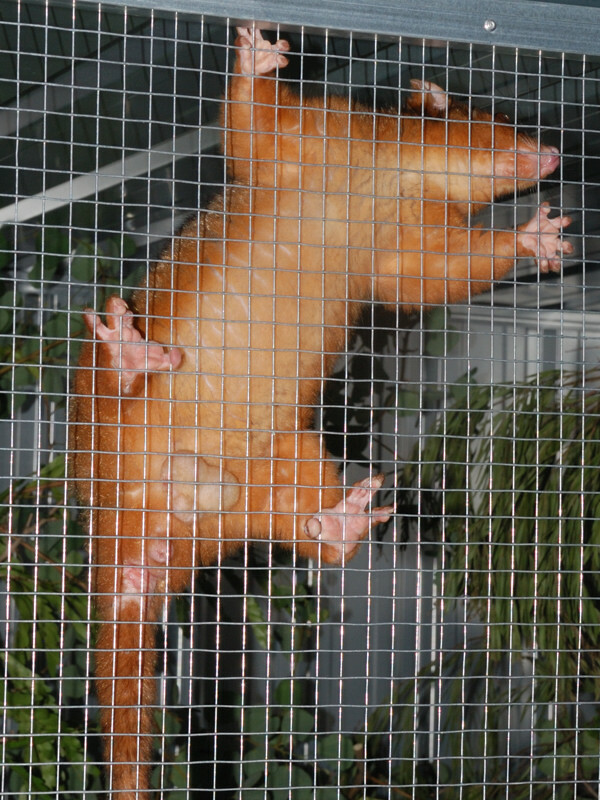 The classic method of capturing a possum is by grabbing the base of the tail and lifting them into the air. The possum might try to climb its tail and bite you, but this is difficult for an adult possum to do and you can prevent it from happening by (in the words of Stephen Jackson) "slowly twirling the animal, as if you were mixing a cake". Gloves are not often used since they make things much more awkward, however some people recommend using them for brushtails who can do a lot of damage if they want to. Gloves are almost never used for handling ringtails who, it is said, don't bite too hard - a claim which I dispute. This technique works well if the possum is on the ground, but if they're in a tree they will hold on with their feet and can be almost impossible to budge. Trying to detach the feet with your free hand is asking to be scratched. In Wasabi's case, lifting him by the tail was out, since that was where his injury was located. It would have been incredibly painful to him and probably would have damaged his tail further. I first tried to capture him by throwing a towel over him when he was sitting on the balcony rail. Unfortunately, he was too quick for me, and went over the edge of the rail in a flash before I could grab him. I suppose at least it was a good sign he wasn't being slowed down by his injury. On my second attempt, I used a bag sewn from an old towel. I had considered using a pillow case, but the opening looked too small to get him through easily. There was a bit of drama using the bag, because I didn't hold the top fully closed when I first captured him and he managed to get out. I immediately tried to pick him up by using both hands around the shoulders, but he didn't like this and gave me good biting. It turns out that ringtails can bite hard enough to draw blood. However, I managed to get the bag over him fairly soon afterwards, and took him to the cage. Fortunately, he didn't bear me a grudge for all the mishandling. This video shows how to give a subcutaneous (i.e. under-the-skin) injection to a very compliant cat. I'm not sure how this would work with an angry cat, though. As you can see, it's not rocket science. However, doing anything for the first time is always difficult. Out of five injections, I missed one altogether and probably lost most of a second dose, so he ended up with 3 or at most 4 doses. You don't have to inject into the scruff of the neck. You need to choose a location for the injection where the skin is loose enough to be be pinched up easily. 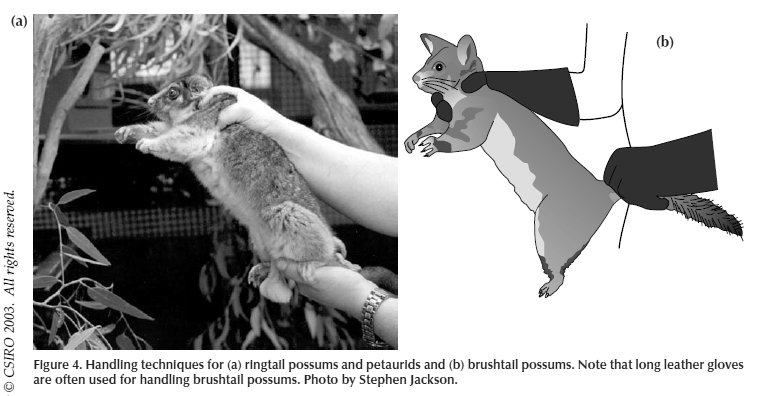 This may depend on the posture of the possum at the time (e.g. the skin on the back might be taut, and difficult to inject into, if the possum is hunched over forwards). Usually on the sides over the ribs is a good place. Also, I got the impression that the skin on the back of a possum is extra tough, although that might be due to errors in my technique. When inserting the needle into the patient, you should hold the barrel of the syringe between the first two fingers and thumb - somewhat like holding a pencil - so you have good control over it and can apply a little force if necessary. Don't hold it between the first two fingers like a cigarette, with the thumb hovering over the plunger; you have less control over it, you can't apply as much force and you run the risk of squirting out the contents accidentally. The video recommends drawing the plunger back after inserting the needle. The idea is that if it's in properly, you'll feel some resistance, and if you see air being drawn into the syringe, there's something wrong (e.g. you've stuck the needle right through the flap of skin and out the other side). However, the vets that I've spoken to don't bother to do this. When I tried, it was difficult to tell how much resistance was enough, and also, in the poor light and awkward position (Wasabi was hanging onto a branch surrounded by leaves), I couldn't see well enough to tell if air was being drawn in. However, I think this tip is worth following, if you can. It's possible the needle won't go in. Sometimes needles can be slightly blunt or maybe burred at the end (they should theoretically come from the factory perfect, but maybe get stubbed on the glass bottle when drawing up or something) or perhaps you've chosen a particularly tough patch of skin to inject into. In this case, you should remove the needle from the syringe, replace it with a fresh one, and try again in a different place. 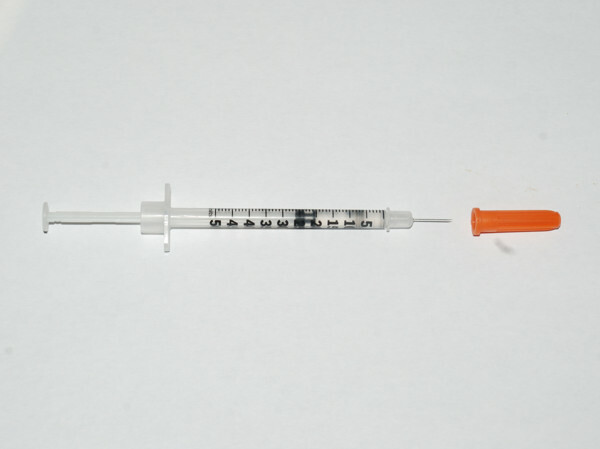 Don't worry about the fact that the new needle is now filled with air rather than fluid; the amount of fluid lost is negligible and the air won't cause any harm with an SC injection. So the message is that if a vet supplies you with preloaded syringes, ask for a couple of spare needles just in case. The type of needle makes a difference too. 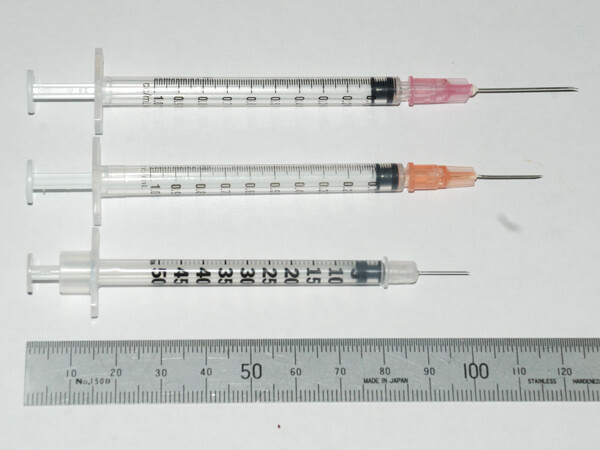 Here are three different types of needles/syringes I used. The top one I had difficulty with; the needle bent instead of going in. I was probably to blame, but the longer needle was less rigid and made things more difficult than they needed to be. Don't use a long needle like this if you can help it. I gave several doses with syringes like the middle one OK, but they sometimes took a noticeable amount of force to get in. I gave one dose with the bottom one. This one went in really easily and Wasabi didn't even notice it. In future, I would (if given the choice) use a short, thin needle like the one at the bottom, but have some spare 3/8" 25 g needles to substitute in case of a thick-skinned possum. I was able to inject Wasabi single-handed. Normally the idea would be for one person to hold the possum down (possibly wrapped in a towel) and another to do the injecting. However, Wasabi didn't mind being touched (and, as it turned out, even having his skin pinched up and injected), but he really hated being held, so it was easier and less stressful for all concerned to give him a piece of grape to eat, and inject him while he was occupied. I don't say this would be the recommended method, but it worked well in this case. With a less compliant possum, one strategy might be to inject them in the day time when they're not fully awake. Australian Mammals, Biology and Captive Management, gives the following diet for ringtails in captivity. Fresh branches of foliage to eat eg E. ovata, E. dives, E.
He was given all of the "Daily Diet", excluding the fly pupae, and all of the "Supplement" except for the eggs/cheese. He was given plenty of fresh foliage - probably more than people normally would use. I tried to get some of every type of leaf that I'd seen ringtails eating (although I omitted camphor laurel, which some people argue may be toxic, although none of our possums have problems with it). He liked climbing through the fresh foliage and ate a lot of the leaves. He also ate the apple, pear and banana, but ignored the remaining (more healthy) items. The almonds were given an exploratory nibble, but then discarded. His poo was collected and examined. It looked normal with no sign of diarrhea. Incidentally, ringtail pee can often contain white solids that look a little like curdled cream. This is apparently quite normal and not a sign of diarrhea, as long as normal poo is also present. In order to make things easier to follow, I'll concentrate on the unpleasant patch of skin under Wasabi's tail. At the start it was raw and weeping pus, but every day brought a noticeable improvement. You'll notice that in the last two photos the fur around the edges looks normal and is not wet and matted like in the first three. This is presumably because he is no longer licking the wound. According to a vet, this is a very fast improvement and shows that he's responding extremely well to the antibiotic. 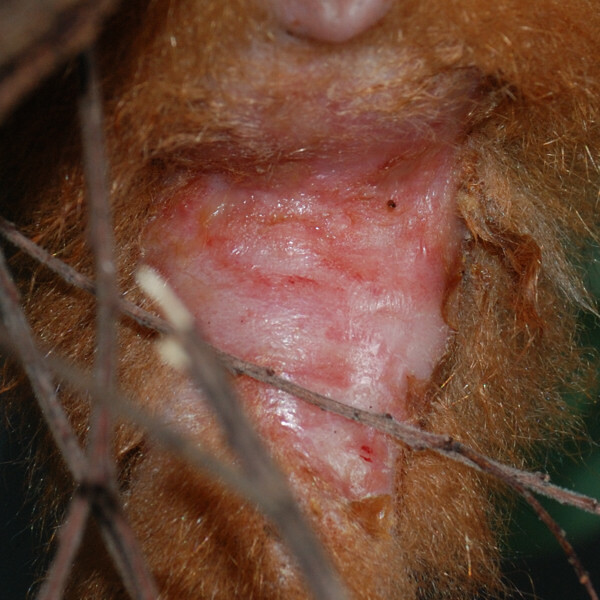 The wound on the back of his tail also showed a similar level of improvement. Wasabi seemed to take things really well. He was active and alert and had a good appetite. He liked to climb amongst the foliage that had been supplied for him to eat, so, rather than small leafy twigs, I provided him with larger branches. He seemed to appreciate this, although it made it more difficult to photograph and inject him, since virtually the entire enclosure was filled with foliage. Often branches would knock against the sides of the cage when he moved around. Brushtails in the trees above (Kiki in particular) would hear the noise and peer down suspiciously at the cage. He didn't like either of the sleeping places I had provided (a ball made from two planters lined with coconut fibre, and a wooden possum box). On two days, he decided to sleep on the floor of his enclosure. This was initially worrying because ringtails don't normally sleep at ground level, but he was active and behaving normally when he awoke. I later put some foliage from a wattle tree (the one in which Tilda had built her drey) on top of the possum box, and he slept amongst this for the remainder of his stay. Wasabi: "I'm OK now, you can let me go!" 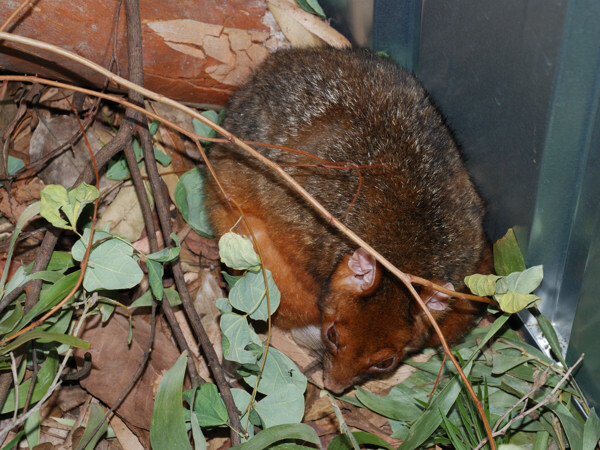 When he was released, he didn't flee the scene at once, but ambled out of the door, came over to sniff the toes of the humans waiting nearby, then walked off into the garden and climbed into a tree where ringtails are often seen. I don't think he was traumatised by his stay, but he was probably glad to leave at this stage. I hope he comes back to visit soon. Most likely there are plenty of wildlife carers and vets out there who do this sort of stuff every day (and are probably thinking I'm making a mountain out of a mole-hill), but there's a real lack of easily accessible information for the rest of us. I'm happy if I can contribute something.